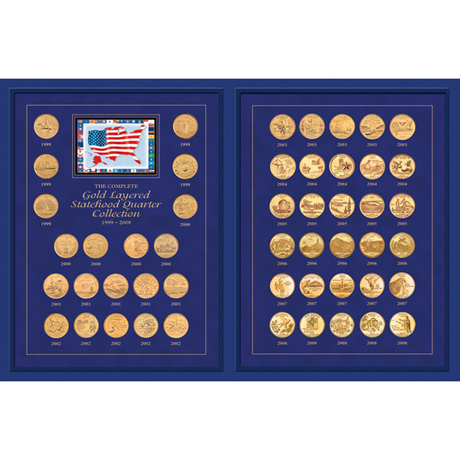 Includes the complete collection of all 50 Statehood Quarters in Brilliant Uncirculated Condition all layered in pure 24k Gold. The Statehood Quarter series was minted from 1999-2008. This beautiful collection comes in a museum-quality portfolio. Includes a Certificate of Authenticity. Allow 2-3 weeks, no rush delivery or gift box. Item can only be shipped within the Continental US.